We are back on this good friday with the latest on findings published on the shroud of turin. The cloth believed to bear jesus' imprint as he was being prepared for burial. There's new research that may prove the claim of people that said it's an elaborate fake. Paula faris has the latest. It is rare we get a glimpse of it. The shroud of turin, one of the rarest pieces of history will be on display in a special televised viewing italian state tv. The exclusive screening is supposed to be pope benedict xvi's parting gift. Billions of people will be getting a rare televised glimpse at one of the world's greatest unsolved mysteries. The shroud of turin. 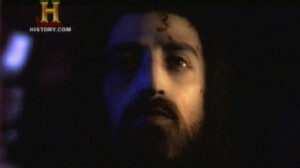 Millions bto be the image of jesus rarely on display, the shroud will be on tv and in the palm of your hand. And now comi on the heels of good friday, new life is being breathed into the shroud of turin. Just this week a new app launched taking the shroud worldwide and into the digital age for the first time all while new research says the shroud could very well be the real thing. When you consider that there are no substances on the cloth that were conceivably used by an artist and the fact that the blood on the cloth is human blood, it would suggest that the cloth is probably authen Reporter: This 14-foot-long linen cloth is believed to have cover jesus christ's crucified body 2,000 years ago covered in bloodstains, dirt and water marks and displays an actual imprint of a man's face. There was no portrait made of jesus so really the shroud still remains the best single thing that we have. Reporter: Nonbelievers say the cloth is the fraud of turin. Ov the past century scientists have used methods such as carbon dating to test it. Most recently determining it to be a medieval forgery but in a new book scientists in italy say they've unraveled that claim. Still, it's not just seeing, it's believing that makes the difference. The shroud can never replace faith. I don't think we can ever know for sure whether it's absolutely authentic because we don't have the dna of jesus to match it up with something we might extract from the shroud itself. The vatican does not have a position on the shroud's authenticity. Ho a previous pope wrote the shroud was a truly mysterious image which no human artistry was capable of proving. Now we have the book, the broadcast and the app. Thank you so much, paula. 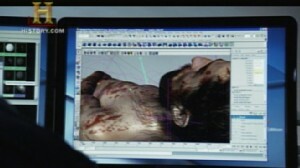 The History Channel unveils a new image based on studies of the Shroud of Turin. Graphic artists use Shroud of Turin to create 3-D portrait of Christ. Now Playing: The Real Face of Jesus?